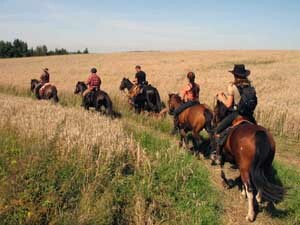 ﻿ Horse ranch Sudety Trail - our offer. Horse trails on hucul horses to Giant Mountains and Jizera Mountains. Riding vacations, horseback riding, trail rides. 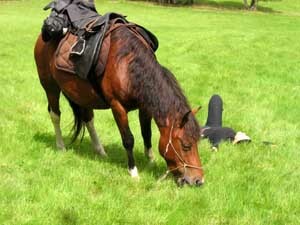 Since 2003 we organize guided trekking tours on Hutsul horses. Most of our horseback riding destinations include: Kaczawa Mountains, Giant Mountains, Rudawy Mountains, Polish and Czech Izera Mountains and The Great Forests of Lower Silesia. The south-western corner of Poland is known for its beautiful landscapes and untouched nature. The immediate vicinity of our horse farm is rich in field and forest paths that lead across wild and barely inhabited areas. It often happens here that you do not meet a single person throughout the day. For all these reasons, this area is perfect for horseback riding. For adventure-seeking, more experienced riders, we recommend the longer rides, where not everything from A to Z is planned. During such excursions, we often discover new ways and places. We try to arrange the routes of our trails in such a way that our guests can get to know some sights and tourist attractions of our region. It is therefore worthwhile to take part in a trail ride, not only because of riding on a horse itself. It is, above all, a unique adventure where you have the opportunity to visit many places of interest, admire beautiful landscapes and at least for a while return to the world of nature. To give you a better idea of ​​how such rides can look like, we invite you to our chronicle of the rides. All rides are accompanied by an English speaking trail guide who will always be there to help and advise you. 6-day horse trail "Western City"
If you attend a trail ride with us for the first time we recommend that you take part in a 5-hour horsemanship training, where you have the chance to work and ride on the horse which will accompany you on the trail. The training starts at 1 pm on the day before the trail and costs 25 EUR. The additional accommodation in our pension including dinner and breakfast is 27,50 EUR.